The Point of Pines Yacht Club Officers and Members wish to express their condolences to Bill and Dana Rogers and the entire Rogers family on the loss of their mother/grandmother, Dorothy Rogers. Born & raised in Revere, she was a resident of Beachmont, Revere all her life and a member of the 1951 graduating class at Revere High School. For many years, she was a stay at home Mom, caring for her family & for her Mom & Dad. 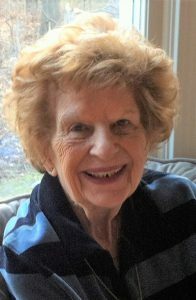 After her husband, William J. Rogers passed in August of 1978, she began a career in 1980 with the then Bank of New England, as a reconcilliator and remained with the Bank, now Bank America, retiring in 2005, at the age of 72 years. She is the cherished Mother of William R. Rogers & his wife, Donna L. of Saugus & Richard W. Rogers of Peabody. She was the daughter of the late, Nelson Orr & Ann C. “Connie” (Waseka) Orr. She is the devoted grandmother of Brian Rogers of Peabody, Kyle Rogers of Lynn, Dana Rogers & his wife, Juli of Swampscott & Kerri Harris of Saugus. She is also lovingly survived by her great-grandchildren, Sean & Lexi Rogers & Brooke Harris. In lieu of flowers, remembrances may be made to the American Heart Association, P.O. Box 417005, Boston, MA 02241-7005.